Ohio is fortunate to have several inns dating back to the stage coach days still in operation. Sadly, one of my favorite places is now for sale. 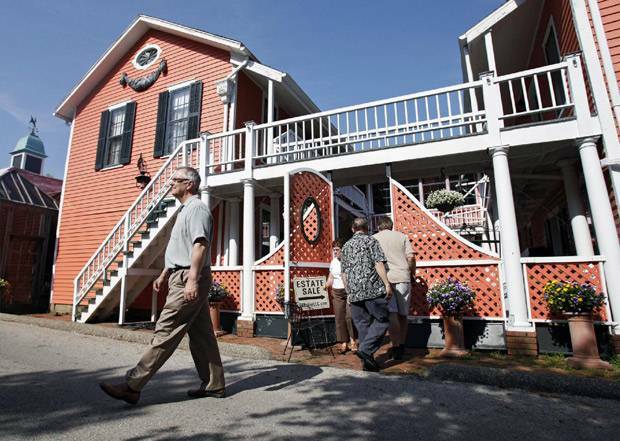 The Buxton Inn in Granville, which has been in continuous operation for 200 years, is on the market and a tag sale is being held now through the weekend—so if you hurry you might be able to own a piece of history. In addition, if you have a few million dollars available you could also buy the inn itself. It comes with a unique history and several ghosts. The first time I visited the inn we sat in the bar which is in the cellar of the inn. An uneasy feeling wrapped around me and I said to my husband I thought it must be haunted. Sure enough, a few months later we watched a Halloween special which featured the inn and several of its other worldly guests. On the second floor of the inn is a grand ballroom and the story goes that the future president of the United States, Maj. William Henry Harrison, rode his horse up the stairs to the ballroom. I’m not sure why the Buxton Inn is my favorite. An equally historic and more stately inn is directly across the street from it, the Granville Inn. I’m not sure whether it is its unique salmon colored exterior, or the cat logo, the ghosts, or the good food but it all combines to create a memorable experience. I hope someone who loves history, unique architecture, ghosts, and good food will continue the 200 years of hospitality at the Buxton Inn. Please click on the link below for pictures of the inn. Buxton Inn begins to clean house. Fantastic- what history! Going back in time. Hopefully the new owner will preserve the integrity of such a marvelous piece of real estate. I agree with you Anne. It would be a shame for 200 years of history, architecture, and artifacts lost.